Europe is facing an explosion of far right movements not seen since the Second World War. This new fascism is well financed, increasingly transnational, and intent on turning the clock back decades on democracy, human rights, gender politics and the freedoms of minorities. What is it that’s tantalising millions of Europeans into this hallucination of the past? And how can civil society and progressive activists respond? 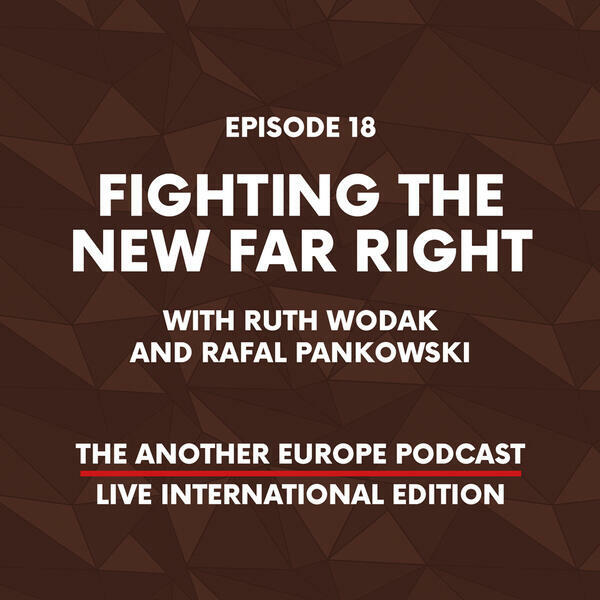 These are the questions we’re discussing on our first ever live international edition of the Another Europe Is Possible Podcast in Vienna, with Luke Cooper, a visiting fellow at the IWM, and Zoe Williams from the Guardian. Joining us on today’s panel are two leading lights of the European academic community. Rafal Pankowski is a sociologist based in Warsaw. His four books on Polish fascism and his irrepressible campaigning on antisemitism and minority rights in Poland has moved the ruling far right Law And Justice party to denounce him as an enemy of the state. Ruth Wodak is an award winning linguist based in Lancaster and Vienna. She’s a leading specialist on European fascism and an outspoken critic of the ruling Freedom Party in Austria, and her indispensable 2015 book The Politics Of Fear mercilessly dismantled the strategies and fictions of Europe’s rightwing populists. Produced in collaboration with Rosa-Luxemburg-Stiftung, Brussels Office. Funded by the German Federal Foreign Office. Hosted by the Institute of Human Sciences (Vienna). How do we beat the centrist party and stop Brexit?